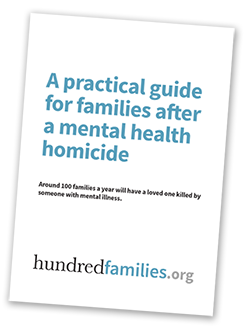 We’ve had lots of enquiries from families about the possibility of taking legal action following mental health homicides and this useful article was written by one of our supporters who is a practising Solicitor. The current state of the law is broadly unsympathetic to those “outside” the hospital gates who fall victim to the actions of patients who have failed to receive adequate or any care and treatment. All health authorities certainly do owe a duty of care to those in their care and are potentially liable if that duty is breached and the damage is foreseeable. However in the situation where a “patient” goes on to kill a member of the public outside the institution itself, the duty to local members of the public has not yet been recognised in English law. It is arguable that the health authority owes a duty to the local community (certainly to provide adequate healthcare) and by implication, owes a duty to protect their safety from dangerous individuals undergoing treatment. It has been argued that members of the local community are entitled to rely on the Health Authority to provide a safe and secure system of care for the mentally-ill. In itself this may lead to legal argument as to whether there was an “unsafe system” or whether the system itself was safe and it was only individual negligence/incompetence that caused the incident. In considering any such claim for negligence, the degree of “proximity” (closeness) between the treatment (or lack of it) and the incident of an unlawful killing, will be very relevant. Should such incident occur a matter of days or weeks after the release or “escape” of the perpetrator, it is currently unlikely that a Court would attach any liability to the failure of the Health Authority to adequately treat the perpetrator – they will argue that the “gap” in the foreseeability of an assault is too wide for the bereaved to be able to attribute the death directly to any failure by the Authority. It is therefore accordingly likely that a successful claim for negligence will have to focus on the foreseeability of a serious assault committed upon the release of the perpetrator from care and treatment. A valid comparison may be sought to be made with the negligent escape of poisonous gas or a negligently-caused flood, whereby the perpetrator may well be currently held liable for the damage caused in the locality. Again the current state of the law is unsympathetic to those in the community who have been assaulted by patients who themselves have failed to receive appropriate care and treatment. The State has an obligation to protect the life of its citizens and to take appropriate steps to safeguard lives (Article 2 ECHR). It has already been broadly established that the National Health Service is “The State” for these purposes. Cases such as Osman have determined that the State may be liable for a breach of Article 2 where they have failed to take such steps where they know or ought to have known that there is a “real and immediate risk to an identifiable individual”. The key words for the sake of current legal argument are “identifiable individual”. Currently the Courts have not engaged Article 2 where the “victim” is not an “identifiable” one. However there are indications that the Court is prepared to hear argument on the point. The recent judgement in Smith –v-Ministry of Defence  contained comments by Lord Mance who said: “Although the operational duty was said in Osman to apply “in certain well-defined circumstances” the subsequent recognition of its application in new sets of circumstances (including by this Court in Rabone) leaves its scope uncertain. As Lady Hale notes in Rabone it is conceivable that the Strasbourg jurisprudence accepts or is moving towards a broad principle that engages Article 2 and requires the State to act reasonably in any situation where the State knows or ought to know of a real and immediate threat to human life”. The availability of funding to bring what may well be a claim with uncertain prospects of success, will in practical terms be a crucial issue. Yet again the position is uncertain. Certainly a purely privately-funded legal case will be very expensive to bring and also carries the risk of a huge costs order made against the losing party. It is definitely not a practical option for most who are affected by the kind of incident giving rise to a possible claim. A claim funded by another individual or organisation is permissible, although certain rules apply to the question of liability for legal costs and (for example) a “down-payment” may be required by the Court. Since 1st April 2013 the rules relating to “no win no fee” cases have changed. It is now possible to bring a claim for damages for personal injury with “Qualified One-Way Costs Shifting” (QOCS). The losing party is not liable for costs and only become liable to pay their opponents costs if they turn down a reasonable offer of settlement (ie if the matter goes to trial and the Court awards a sum equal to or less then, the offer previously made). This option would appear to hold out some hope of practical application to these cases. However the change is so recent that it is difficult to predict how QOCS will work in practice. Can it be certain that no liability for costs will result to the “victim`s” family? In any event the Claimant will have to meet any expenses upfront, which will be in the region of £2-3,000 in a typical case. With a conventional “no win no fee” case the main problem is now to be able to secure “After the Event” insurance against having to meet the other side`s legal costs if the case is lost. The insurance market fluctuates in terms of the products offered and there is no easy answer here save to try to “shop around” for a suitable policy. The main problem (as above) is the sheer uncertainly of the law in this area, and an insurer may not feel that such a case is a “good risk” without some persuasion. In addition since 1st April 2013, the insurance premium is not recoverable from the opponent, so a decision would have to be made based on the feasibility of deducting of the premium from any damages recovered. If you are considering taking legal action, please get professional advice. We know of a number of firms who have expertise in this area.